Time to learn some basic huganomics! Never judge a book by its cover, and never judge a clown by his scary face. When I first saw Dropsy’s titular yellow-toothed, dead-eyed, fingerless circus entertainer, I was worried I was just going to be experiencing another “Killer Clown” story that hasn’t been original since Stephen King wrote “It”. Dropsy is different. There’s not a shred of malice in the kind-hearted clown. He just wants to hug people and make friends. However, Dropsy has been blamed for starting the fire that killed his mother and many others. He is now shunned by almost everyone he meets. Ugliness is all too often a narrative shorthand for evil, but Dropsy asks us to look beyond appearances and learn to love the unlovable. Like the lead character, Dropsy is charming by how good-natured and fun it is, even though it’s a little clumsy as it tries to make you smile. Dropsy is a point n’ click title with the gameplay and visual style of a classic Lucasarts adventure games from the nineties. Like Doctor Who’s Tardis, Dropsy’s baggy beige pants can store a physics defyingly vast inventory of random items. You use these items on characters and other hotspots you find to solve puzzles and progress through the plot. Dropsy certainly needs every piece of miscellany he can find too, as he starts the proceedings in dire straights. 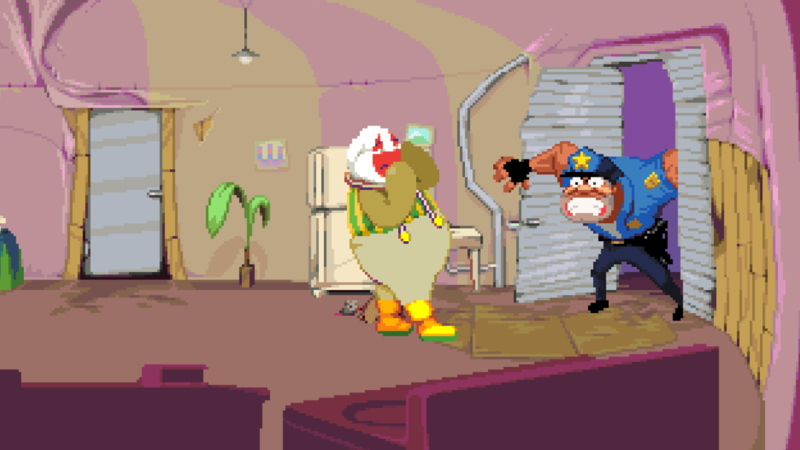 With the whole town against him, Dropsy lives a subsistence lifestyle with his sick father, who is forced to work at a junkyard to support the two of them. Dropsy’s quest is simple: to hug everyone (and everything) he meets. Since most people shun him though, he needs to help them with their problems before they’ll accept a cuddle. He meets proselytizing evangelical preachers, protesting hippies, snide indie music fans and even an executive of a company that produces medicinal ice cream sandwiches. 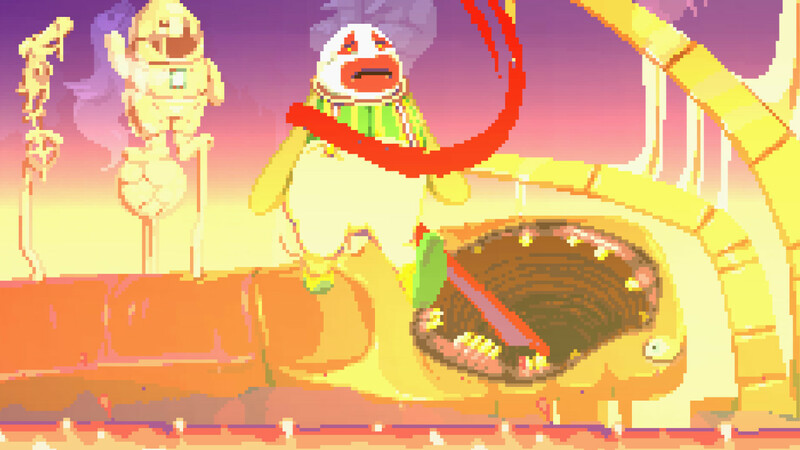 So much of the humour and pathos of the game is derived from how Dropsy isn’t suspicious of any of the diverse cast, he just wants to be their friend. What distinguishes Dropsy from other adventure games is how deeply it immerses you in the role of an unusual protagonist. Dropsy has the mind of a child. His bedroom wall is covered with crayon-scrawled drawings of those he’s hugged (which serves as a handy in-game scoreboard) and gurgles with contented glee every time he successfully embraces others. When he sleeps in his bed (with a happy face drawn on the headboard), he experiences nightmares of his room being warped by visions of blood, of the death of his mother, and being eaten by a a toothy pit of jaws emerging from the ground. All dialogue with other characters is provided with speech bubbles above their heads with pictorial symbols illustrating what they’re saying. Design-wise, delivering information this way is certainly a gamble, but it really helped me empathize with poor Dropsy, who doesn’t understand the complexities of the world, let alone why people are angry at him. Also, there’s no text whatsoever – not even in the menu screens. The closest to text you’ll find is incomprehensible scribbles on pamphlets and papers. Dropsy’s world is a weird and wonderful one where everything has to be decoded through visual clues. 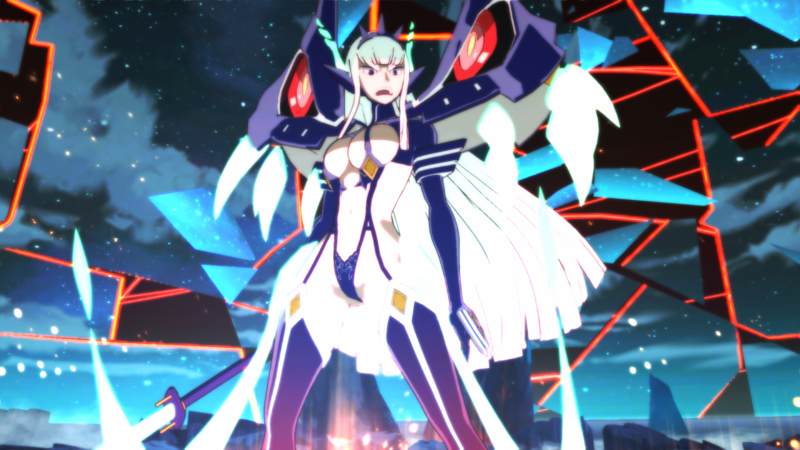 With this visual focus, it’s good that the old school pixel-drawn art and lovingly made animations are so engaging. Dropsy strikes a brilliant duality between freakish and adorable with how his digit-less fingers mash over keys when you try to use the phone or how his arms wiggle around like they were made of jelly when he celebrates. The music too, adds to the sense of strange ambivalence, with down-tempo jazz and nostalgic bluesy guitars providing a contemplative backdrop. All elements coagulate to make an intriguingly bizarre atmosphere that begs exploration and understanding. Dropsy is a little bit more open ended than traditional titles of its ilk, letting you go on a hugging spree of every person, animal and inanimate object you can find without affecting the plot progression. 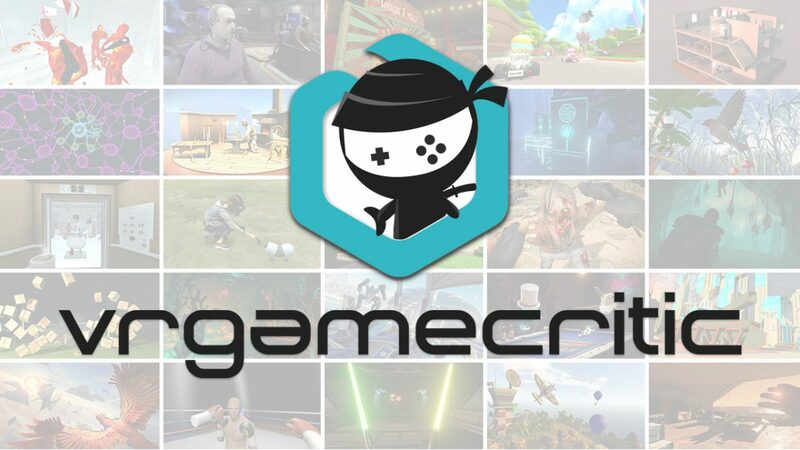 There’s also a handy map helping you navigate the gameworld and remind you where to go next, so you don’t forget what you’re doing while exploring. At the mid-point of the game, there’s even a car for fast-travelling, sparing you having to amble around the entire map screen by screen. Despite the retro style, there’s thankfully some modern conveniences that make Dropsy more accessible. 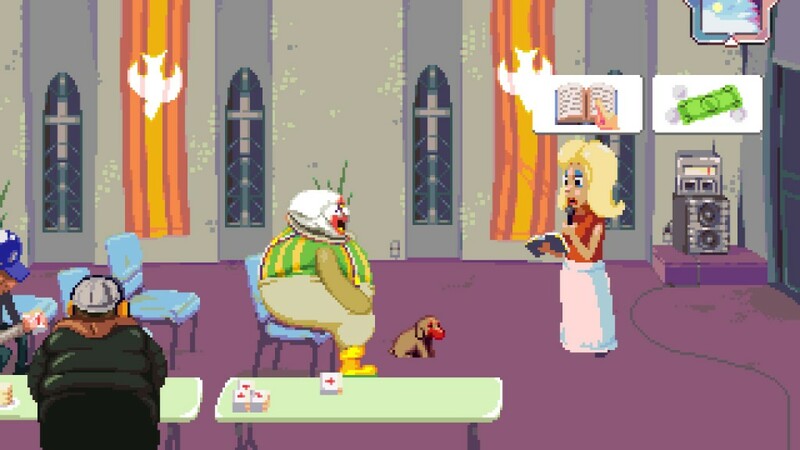 During Dropsy’s quest for redemption, the affable clown is joined by animal companions. You can take control of Dropsy’s bestial followers at any point. There’s a facepainted dog, a mouse and a bird. These creatures add an extra dimension to the game. The mouse can scurry through tiny spaces, the bird can fly up to grab previously unreachable items and the dog can dig things out of the ground. Your canine pal can also, erm, urinate on various fire hydrants (and hydrant-like objects) you find throughout the world, providing another weird rubric for success. Interestingly, Dropsy also has a day and night cycle, which is a unique innovation for the normally temporally static point n’ click adventure genre. Some puzzles require you to wait for the right time of day before solving them. Since the various beds you’ll find let you skip time, you won’t need to wait too long. The extra variables to every puzzle just made my self-satisfied nodding even slower and smugger when I worked them out. There’s a particularly entertaining puzzle where you’ll have to wait until night-time to infiltrate a secretive research facility with the mouse. Not to spoil anything, but the solution involves security robots who switch between shooting at you and serving you martinis while playing lounge music. One issue I was concerned about while playing my preview build of Dropsy, was the unintuitive nature of the puzzles. However, the full build of the game has fixed many of these issues. Characters you meet now offer much clearer clues of what Dropsy’s next objective is. Puzzles are usually straightforward enough that you feel clever for solving them without struggling too long with increasingly absurd attempted item combinations. However, there are a few exceptions. There was one puzzle that required me to hug a character more than once, even though in every other instance, a hug represents the culmination of a puzzle rather than part of it. Another quandry – involving a rose – offered me a red herring solution so seemingly obvious I thought the game was bugged when it didn’t work. 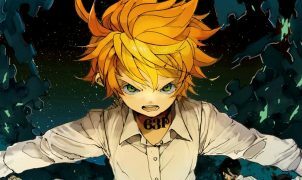 The puzzle was only resolved incidentally by progressing further in the plot. Though I loved watching Nickelodeon cartoons and listening the Spice Girls, one thing I didn’t like about the nineties was fuming at obtuse puzzles made by cheeky game designers. Dropsy’s biggest flaw is that it sometimes leaves you confused at exactly what you’re doing, or what’s going on, because of the lack of information it offers you. However, this is also part of what makes Dropsy special: how it took me back to a child-like state of mind. It did this with its retro style reminiscent of point n’ clickers I played in my youth, and how it forced me to evaluate a confusing – and sometimes frightening – world by the simplest of means. Dropsy lets you experience its strange world with its hero’s childish sense of naive wonder, which is why it’s often so funny and heartwarming. Most importantly though, Dropsy reminds us all to be less judgemental, and give more hugs. Full disclosure: A review copy of Dropsy was provided by the publisher.